Oak root fungus, more properly called Armillaria root fungus, is also called honey fungus, mushroom root rot and shoestring fungus. Armillaria mellea is a common soil-borne fungus found in temperate regions throughout the world. More than 50 distinct varieties of the fungus attack the roots of hardwoods, conifers and herbaceous shrubs. The fungus begins rotting the roots when plants are under stress. The rotting roots deny infected trees water and nutrients. The fungus works its way up the tree, eventually encircling the trunk. Armillaria mellea develops most rapidly under warm, moist conditions. It can survive indefinitely on diseased or dead roots. Leaves of trees and plants infected by Armillaria fungi usually turn yellow; they are smaller and there are fewer of them. Some plants deteriorate slowly over years; others wilt quickly and die abruptly. Trees often suffer infection for years before the fungus is diagnosed. Armillaria spores spread by means of root-like black structures that can be seen on the surface of infected roots and under loose bark. The fungus uses these rhizomorphs to spread from tree to tree. 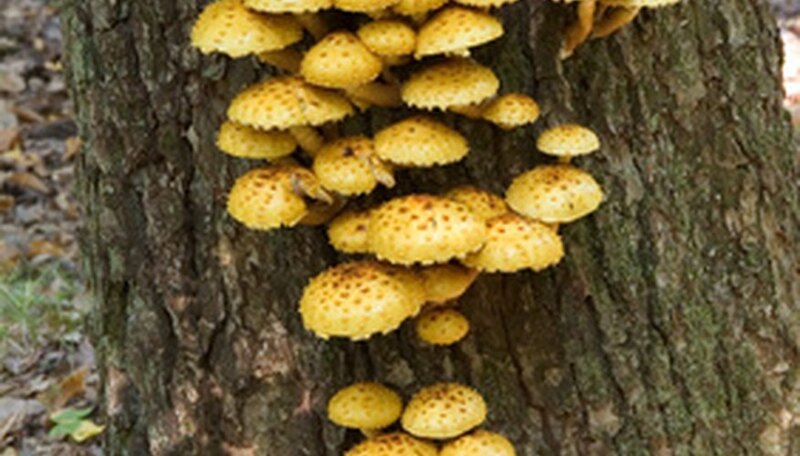 Fruiting bodies in the form of honey-yellow to tan and brown mushrooms often form in clusters on the roots or lower trunk of diseased trees. These are usually two to five inches wide and four to five inches tall with gills attached to the stem, which has an annulus, or ring. Infected trees do not always produce mushrooms. When the mushrooms do appear, usually in the fall or winter, they are short-lived. The most common sign of the fungus is vegetative strands called mycelium. These fungal threads grow together to form whitish, fan-shaped, flat, leathery plaques. Fresh Armillaria mycelium smell like mushrooms. To find them, pry back lower portions of bark or dig down to expose the root crown and major roots. For definitive identification, keep the mycelium strands cool and moist and take them to your agricultural extension service. Horticulturalists at the University of California, Davis, and other university researchers say infected trees cannot be cured with fungicides. However, there are other methods for controlling oak root fungus. Plant only species that are highly resistant to Armillaria. Try not to let the plant become stressed by insects, drought or poor irrigation. Armillaria fungi thrive in moisture and cannot stand dry conditions. Remove soil for a depth of nine to 12 inches around the crown and the upper roots. Leave this area exposed to the air and keep it as dry as possible. Make sure that this hole is free of leaves and debris. Root collars can be used to prevent the infection from spreading upward from the roots. Roots of infected trees should not be allowed to come into contact with healthy trees.